A10 Compressed Air Services is proud to serve our nation’s veterans. 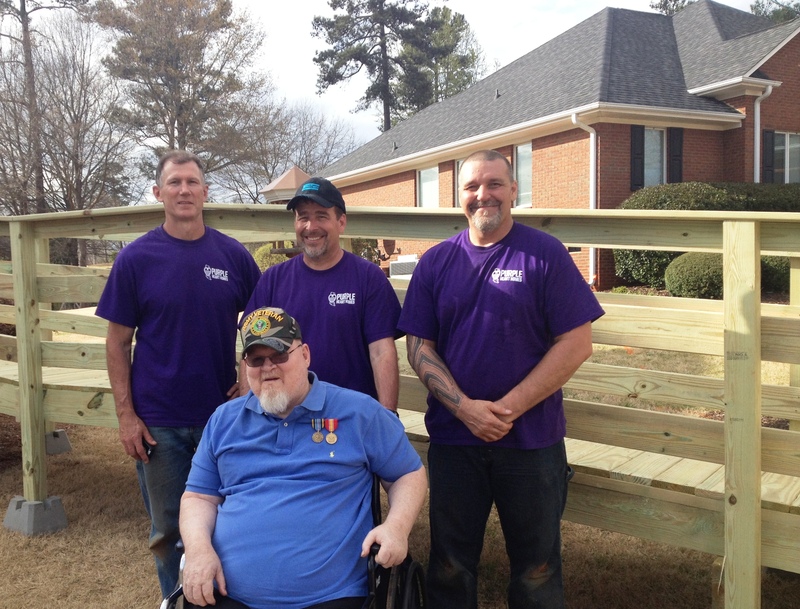 This week, A10 President Jervey Inglesby and about a dozen other volunteers worked with Purple Heart Homes to build a 60 feet-long wheelchair ramp for wounded veteran Carl Murphy. Purple Heart Homes is a charity group founded in 2008 by John Gallina and Dale Beatty, both combat-wounded veterans. The charity works with the Home Depot Foundation and other veterans to complete special projects. The local chapter, Golden Corner Chapter, is led by Larry Druffel in Seneca, SC. The original estimate for the ramp that wife, Carol Murphy, received was “staggering,” but with the help of Purple Heart Homes, these deserving veterans paid zero dollars! Without this ramp, Carl was without reasonable access to the world outside of his home. We would like to thank Billy, the Home Depot manager at Dorman Center in Spartanburg, who donated the materials for the ramp. “We are truly grateful for these good people who took time from their lives to give us the wonderful gift, “says the Murphys. “God bless them!” Thank you, Purple Heart Homes! The A10 brand is centered around the A-10 Warthog aircraft designed for supporting our ground troops. As always, we aim to support military families. This mission motivates each one of the A10 team members every day. A10 Compressed Air Services provides a full range of Atlas Copco air compressors, products and Universal custom air systems for companies in South Carolina. For more information, call (864) 605-7792 or email sales@a10air.com.